A Custom wireless remote control gives the operator freedom and the opportunity to change or enhance the ride at will, giving the power to provide a fun and thrilling experience. The operator has complete control over the participants, allowing young children to bounce freely or provide assistance to jumpers by raising them higher in the air. This product is perfect for corporate events, military recruiting, malls, fairs, farmer’s markets, marketing and promotions, zoos, resorts, waterparks, street fairs, carnivals, church festivals, schools and anywhere you can fit an air jumper. If you don't have the room for a full size 4 station setup, this is the unit for you. We reduce it to a 2 station using only the center two stations. Setup size for a 2 station is 30 feet wide by 55 feet long. 2 separate breakers are needed to run this item. 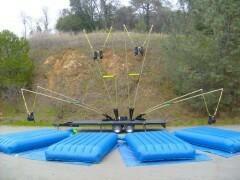 A 20 amp withing 50 feet of the back of the unit and a 15 amp withing 100 feet of the jump pads. If power is not available, you can add the INLINE QUIET generator to the order. The cost for this generator is $75.